Tardivo radicchio is an Italian heirloom variety known as Fiori d'Inverno, which is Italian for "winter flower”. Tardivo radicchio has unique, long and slender burgundy leaves with white ribs that are oftentimes tinged with lime green. Its unique shape and coloring is achieved through a forcing growth technique which takes place after their initial harvest. Tardivo radicchio has crisp leaves that are somewhat splayed out like fingers. Tardivo Radicchio offers a strong bitter flavor. 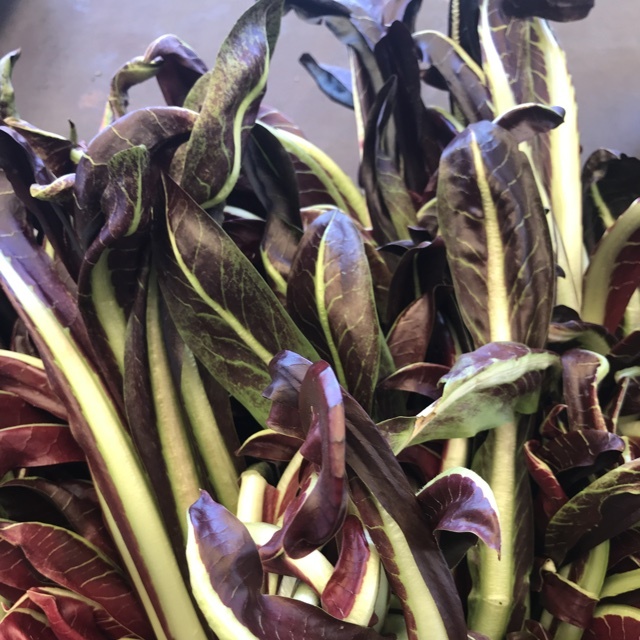 Tardivo radicchio is available during the fall and throughout the early spring months. Tardivo radicchio, botanically classified as part of the Cichorium genus and the intybus species is a late harvest member of the Composite family. All true Tardivo radicchio is grown in the northern part of Italy in and around a town called Treviso. The chicory relative has a special status under the Indicazione Geografica Protetta (Protected Geographical Indication), meaning its quality, reputation and characteristics can be traced back to a specific geographical region. Its name is therefore protected and limited in use to the plants grown in the immediate area. Tardivo radicchio is a variety of Radicchio Rosso di Treviso, which also includes Precoce radicchio. The name Tardivo refers to the late harvest of this leafy Italian plant. The crisp texture and bitter flavor of the Tardivo radicchio is often served as a side dish, roasted or grilled and drizzled with olive oil. 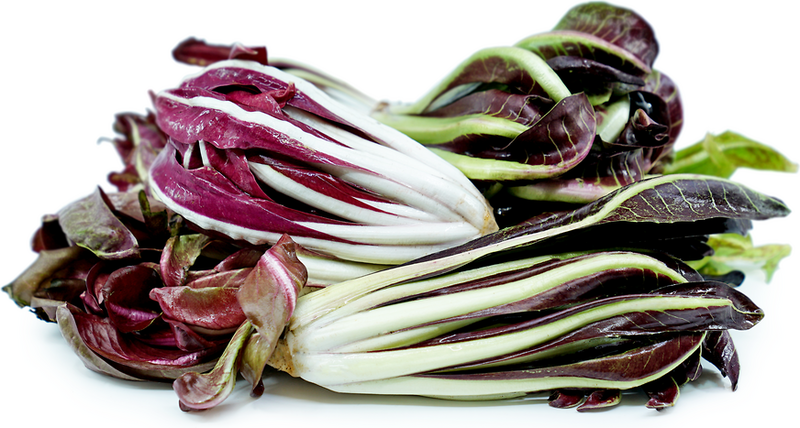 The “late” radicchio of Treviso can be added to risotto, red sauces and stews or baked into a strudel or quiche. The crisp leaves are also eaten raw, much like Belgain endive. Its flavor and texture marry well with citrus segments, fruity olive oil, tomato, vinegar, bacon, olives, garlic, shallots, Asiago and Gruyere cheeses, polenta and Cognac. Tardivo radicchio is best kept wrapped in plastic in the refrigerator and consumed within two weeks. 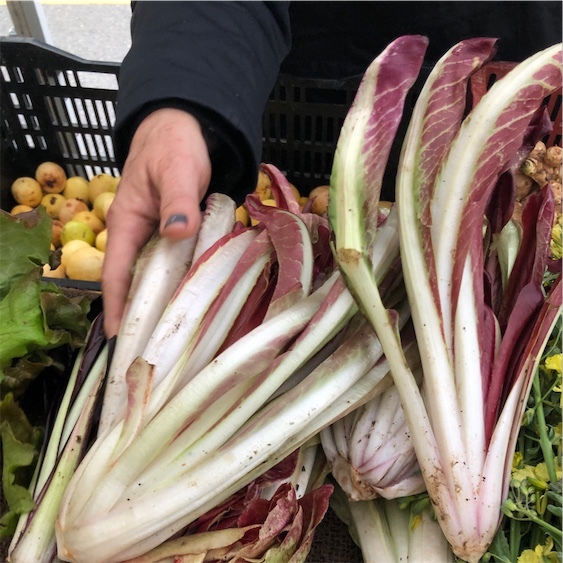 Grown in the area in and around Treviso, a city north of Venice, Italy, the uniquely colored and shaped radicchio was created by Francesco Van Den Borre, a Belgian agronomist in the 19th century. The technique he used to create the look of Tardivo radicchio is called imbianchiamento or “whitening.” The radicchio is harvested late, using a special machine and is then put through a forced second growth and blanching process that creates the white veins which are so prominent in the appearance of the Radicchio di Treviso. Recipes that include Tardivo Radicchio. One is easiest, three is harder. People have shared Tardivo Radicchio using the Specialty Produce app for iPhone and Android. Sharer's comments : Tardivo Radicchio spotted at Chino's Vegetable Shop.